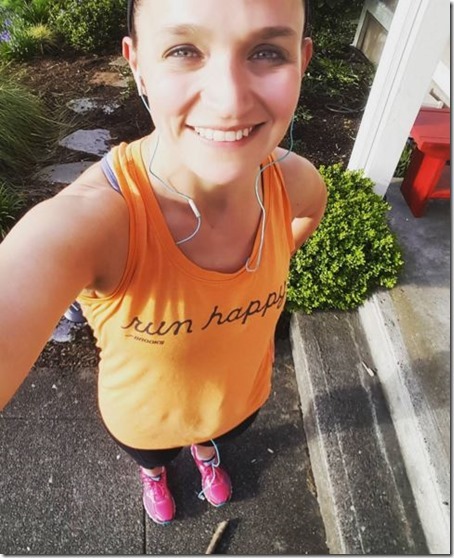 Let’s talk about running – shall we? I had just started to really get back into running these past few months. 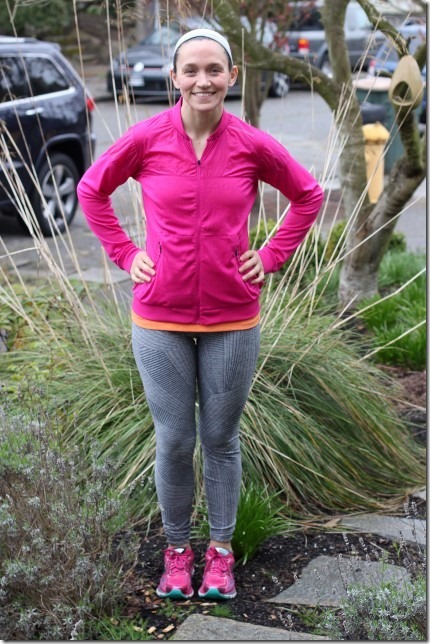 Winter was a cold, rainy, slog, and I was going way more in the way of ClassPass classes and strength training than actual running. 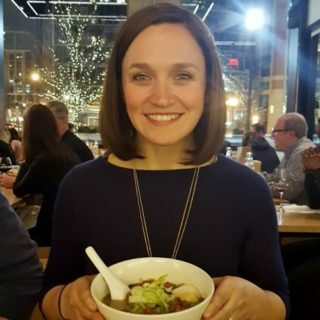 But once the New Year hit, I started lacing up again – mostly credited to my running buddy, Lacey – helping me commit to 6am early runs no matter the weather. It is SO much easier and more enjoyable to run with a friend, and even though I often dread those dark, sleepy runs – I am always so happy for the morning chat. No better way to wake up! And now that Daylight Savings has arrived, there is so much more time in the day to squeeze in runs. With the sun setting so much later now, I can even run after the kids go to bed, which is a total game changer. Three cheers for the return of tank top weather too! 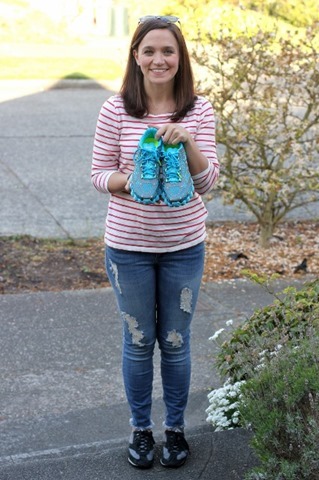 I’m running in some new shoes this year too, so I wanted to tell you guys all about those (and if you stay with me all the way to the end, you also get a chance to win a free brand new pair of running shoes!). 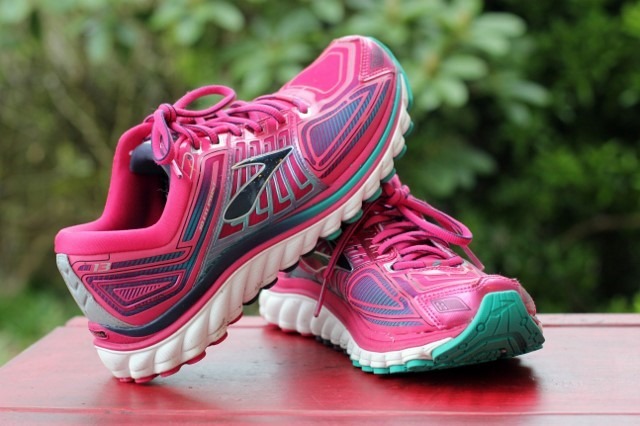 When I first joined the Brooks Blog Ambassador group last year, they set me up with a new pair of core running shoes to get started. 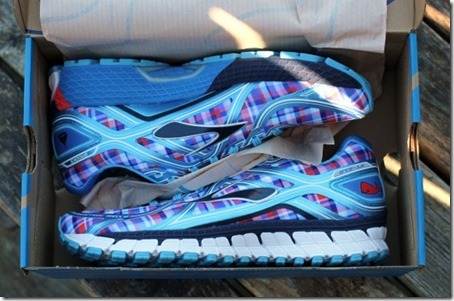 I went to our local Trailhead store and tried on a few of the different styles, and settled on the Brooks Glycerins. With over a year of mileage on those shoes (and three half marathons later! ), it was time to pick a new shoe for the coming year. I liked my Glycerins so much, that I didn’t want to mess with a good thing. 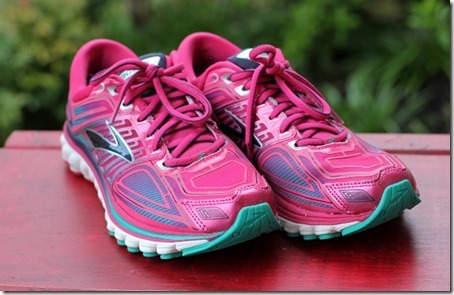 So I chose the new Glycerin 13’s in this gorgeous pink color! Aren’t they so fun!? I can’t tell you how much I regret wearing boring white running shoes for so many years. The more colorful the run, the better. They’re also the perfect match to my beloved Run Thru Jacket <—seriously, favorite running outerwear ever! 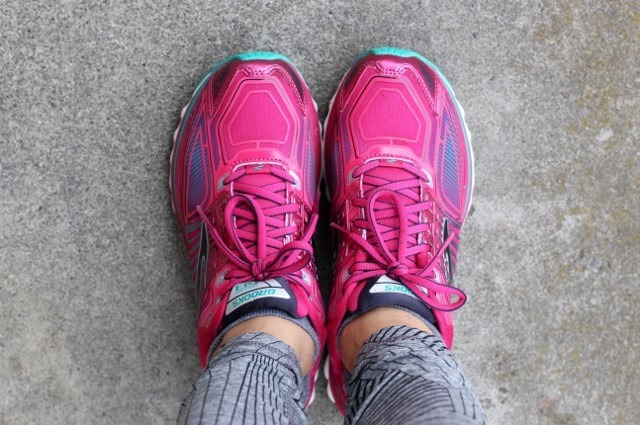 I run in neutral shoes, and I love the Glycerins because they are perfect for my stride with just the right amount of cushion. 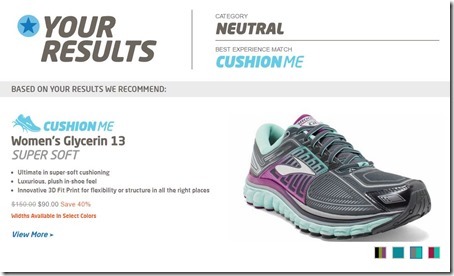 So speaking of stride – in order to outfit runners with their perfect pair of shoes, Brooks recently launched their Shoe Finder. It’s a super user-friendly and fun questionnaire that helps guide you to the ideal shoe for your goals and your body. 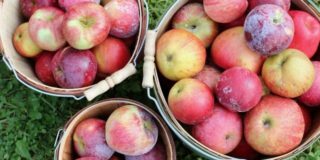 It takes about 30 seconds to answer all the questions, and then makes recommendations based on your answers. 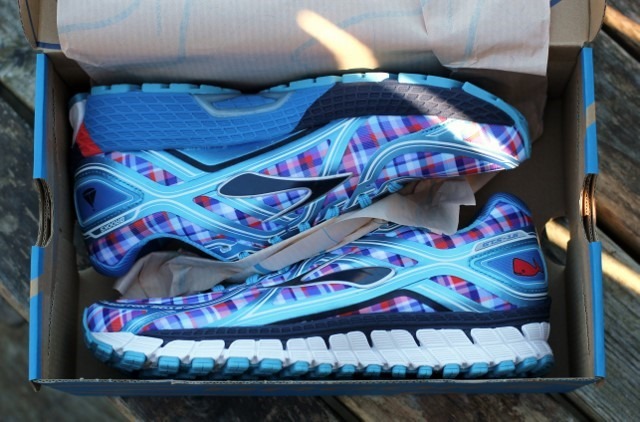 The process is centered around the four experiences Brooks has targeted for runners. 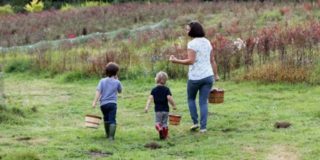 And hey – look what they told me I should be running in! And I couldn’t agree more. So happy with my new pink kicks. In addition to the every day running shoe, Brooks also lets us try some of the specialty and more minimalist shoes. 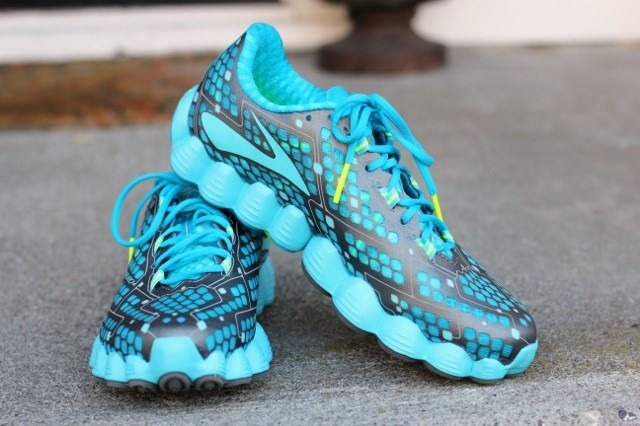 Check out the brand new shoe just released in the Brooks lineup – the Neuro! When I first saw these, I thought they were a little whacky looking. But all of that slipped away when I tried them on. They are SO cushy and literally mold right to your foot. 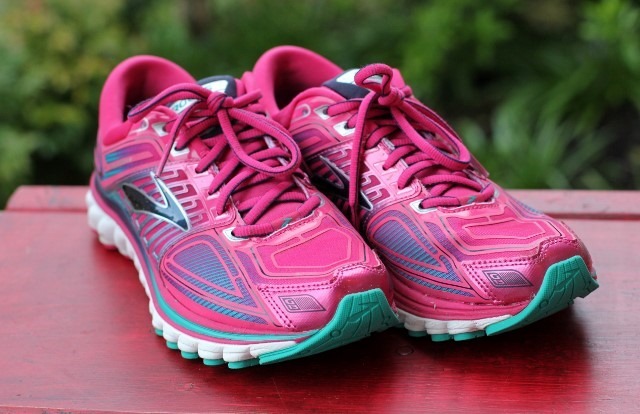 Go full-tilt in these performance-enhancing neutral running shoes for women. Whether you’re racing others, or just against your personal best, our Propulsion Pods rapidly return the energy you put in to keep you at your fastest every time you lace up. The heel and forefoot move independently for powerful push-offs thanks to a Gearing Mechanism, and each pair fits like a second skin—our Dynamic Hammock System wraps underfoot and tightens through the eyelets for improved foot alignment. This lightweight women’s running shoe takes our best-in-class fit and bio-mechanics technology to a new stratosphere. Make the most of every effort, every run, and every mile. 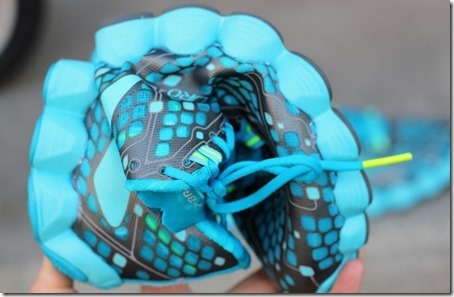 Check out the amazing flexibility of the shoe – you can literally bend it in half. And like so many of the other Brooks shoes, it also has fun sock-liners inside. Love the Carpe Runem / Run Happy message – a great reminder for every run! 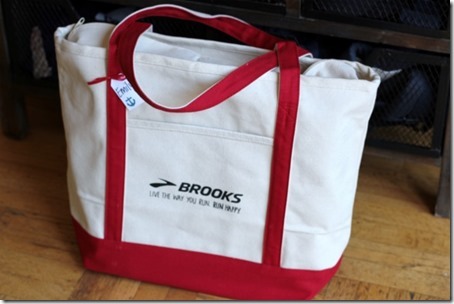 And last but not least, I got another fun surprise from Brooks this month (yes, we are very spoiled with shoes!). 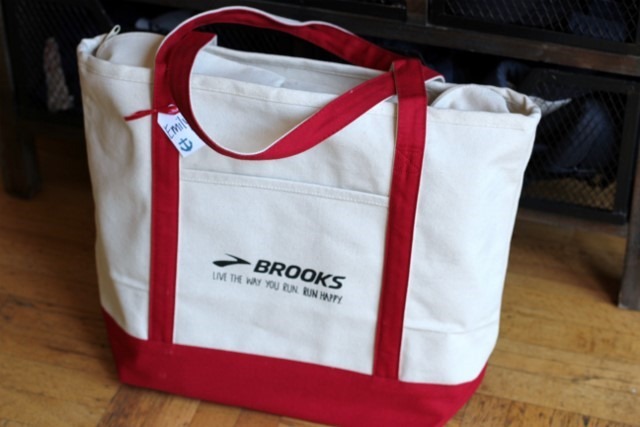 Imagine my excitement when this amazing zippered tote arrived earlier this week. You will see me carrying this to the beach all summer long! And inside was a fun surprise, all wrapped up in Brooks beauty! Oh hello, gorgeous. Can you even handle this plaid!? 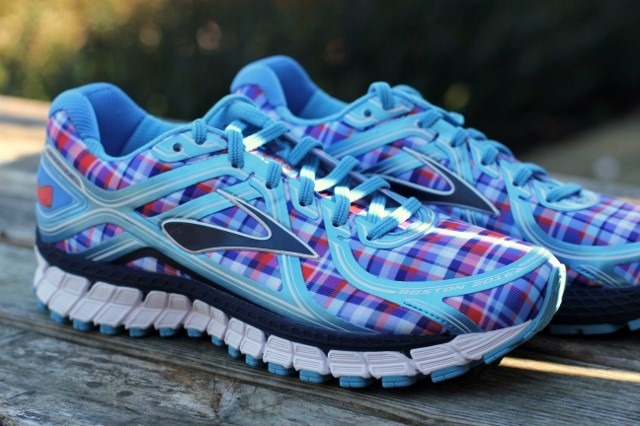 These special Brooks Adrenaline GTS shoes were just released April 1st – to pay tribute to the 2016 Boston Marathon. Driven by the coastal culture and sailing roots that define the destination for New Englanders, the limited-edition shoe represents the revelry of summer and miles spent running the streets of Boston. 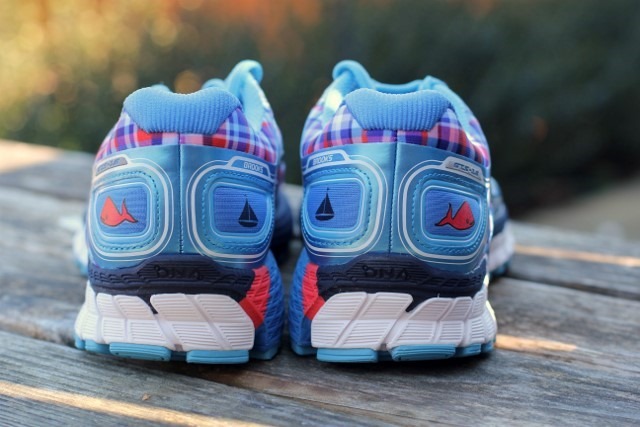 The shoes are adorned with nautical elements and tributes to Boston culture all around – adorable sailboats and whales on the back. 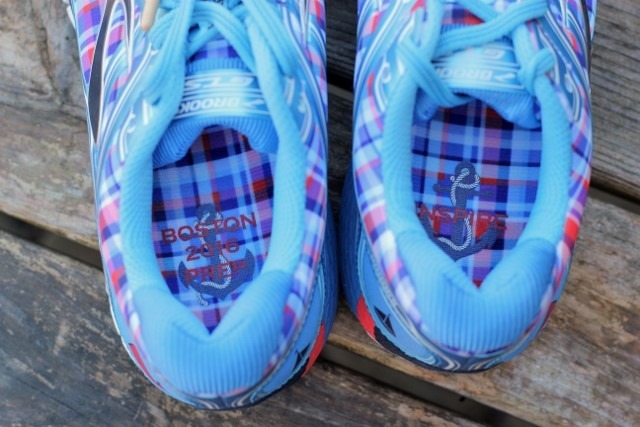 And as always, the custom sock-liner with the words “BOSTON 2016 PREP” and “INSPIRE” – it doesn’t get more inspiring than wearing a custom shoe to your dream race! 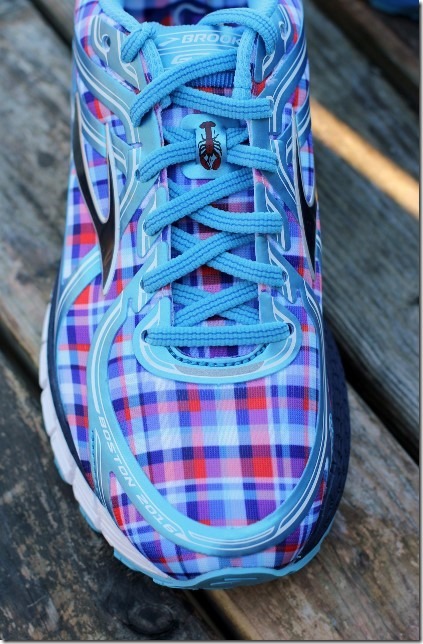 I will probably never run the Boston Marathon myself (slow poke alert), but I sure do love these shoes, and I plan to rock them all over Seattle. Now for the fun part! 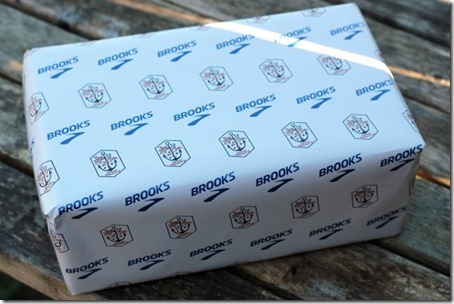 You guys can win your own pair of Brooks running shoes! 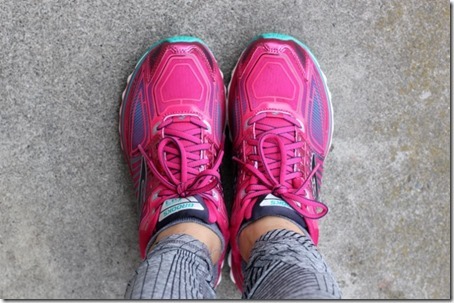 Just click here to do the Shoe Finder, and tell me what kind of shoe you are best suited for, and any upcoming running plans you might have! Leave your answer in the comments, and I will announce the winner on Monday April 11th. 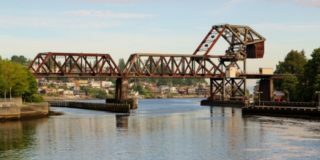 I just registered for the Brooks Trailhead 15k coming up here in Seattle on May 22nd, so I need to kick it into gear and get moving if I’m not going to collapse on the course. 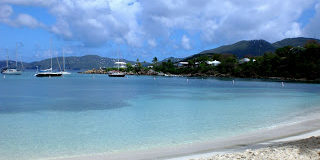 « Previous PostLuxury with Leesa. Next Post » All-Natural With LOLA. I got Women’s PureCadence 5! They look awesome! 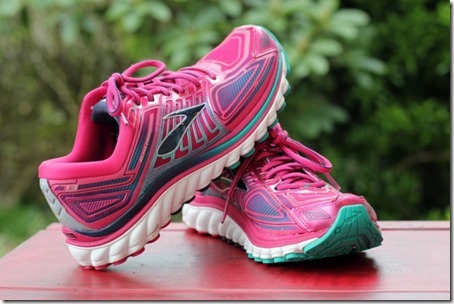 I got the Glycerin 13! I think that’s what I have now! 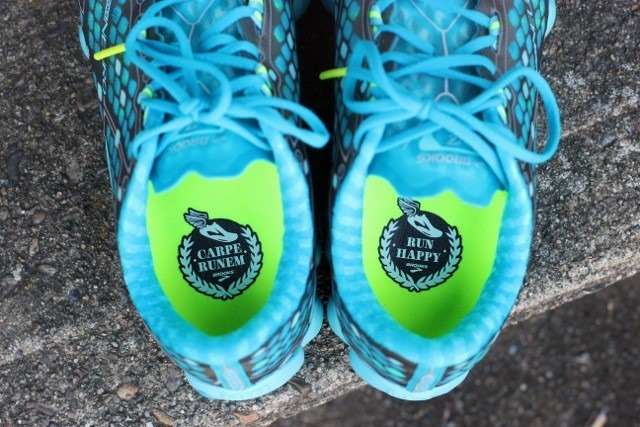 The only upcoming run I have is the Color Run in May and I’m kind of excited about that. I got the PureFlow 5! Currently running every day! Ohhhh glycerin 13!!! Yes please!!! I got the Cascadia 11. 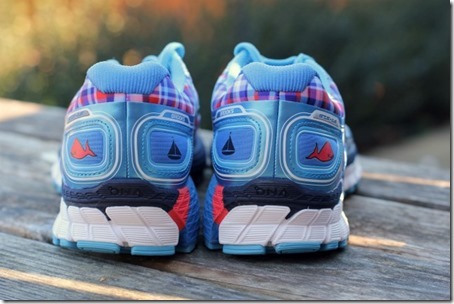 I think I’m too late, but I got the Cascadia trail runner, which would be great to try! Pingback: Daily Garnish » Blog Archive » April Flowers.